If you were one of the 69,671,272 fans who paid to watch a Major League Baseball game this season or one of the 22,174,263 who spun a National Hockey League turnstile last season, you know attendance comes with its inherent risk of injury. Line drives and flying pucks have inflicted serious injury and, in the case of 13-year-old Brittanie Cecil in 2002, death, when she was hit in the head by a puck during a Columbus Blue Jackets game. The small print on your ticket explains in legalese that clubs are not to be held responsible for injuries that might occur. What’s left unsaid is the suggestion fans remain alert at all times to protect themselves. And after seeing many fans struck by stray foul balls and pucks, MLB and NHL teams added extra protective netting down its baselines and behind its goals. But what about golf, where nothing but attentiveness and good fortune can protect the gallery from being struck and injured by an errant drive? 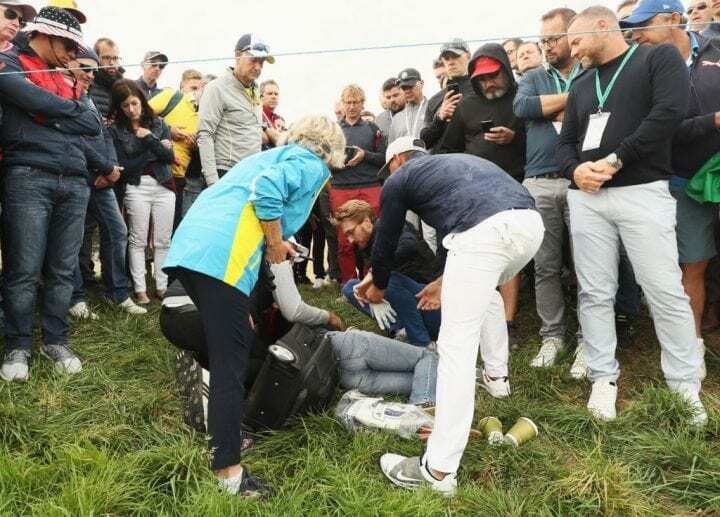 Last week at the Ryder Cup in France, Corine Remande, a 49-year-old spectator, was standing in a crowd, inside the ropes, far down the left side of the fairway on the par-4 sixth hole at Le Golf National when she was stuck and blinded in the right eye by Brooks Koepka’s tee shot. The Agence France Presse reported the ball caused a fracture of the right eye socket and an explosion of the eyeball. Friday on the Today Show, Remande said doctors informed her she might have died if the ball struck her face at another angle. Ironically, the injury was sustained during the only match Koepka, the world’s No. 3 player, won during Ryder Cup play. And then earlier this week at the Dunhill Links Championship in St. Andrews, Scotland, a female fan was left bleeding from the head after being struck by a tee shot from Tyrrell Hatton on the 15th hole at Kingsbarns. What now complicates this issue for golf is that Remande’s family is contemplating legal action against Ryder Cup officials, claiming not enough was done by marshals along the fairway to warn spectators the drive was headed their way. The Ryder Cup issued a statement on Tuesday indicating it was “distressing to hear that someone might suffer long term consequences from a ball strike. “The spectator hit by a ball at the 6th hole during Friday’s play was treated by first responders immediately and taken to hospital. We have been in communication with the family involved, starting with the immediate on-course treatment and thereafter to provide support, helping with the logistics of repatriation, including providing a transfer for the family from Paris to Lyon. We will continue to offer support for as long as necessary. You can imagine how the sport might be impacted if Remande’s suit is upheld and legal damages assessed. How can organizers of golf tournaments begin to act to protect their fans from injury? There is legal precedent for spectators filing suit against tournament organizers after being injured. Sports Illustrated pointed to a case heard by courts in Minnesota during the 1980s after a fan, Mary Grisim, was hurt while sitting under a tree at the 18th hole of a Pro-Am. An errant shot struck Grisim in the left eye leading to its removal. Grisim sued the tournament and golfer. The court exonerated the golfer, citing an obvious accident. But it did argue that Grisim had the right to “consider the quality of safety measures” offered.